Looks like my "schedule" with covering this card set is slipping! As it’s been several months since I last touched on this, I’ll "lead" with the links to the previous posts in the series! This is another page of mostly characters I’m at least familiar with, if not entirely informed on. 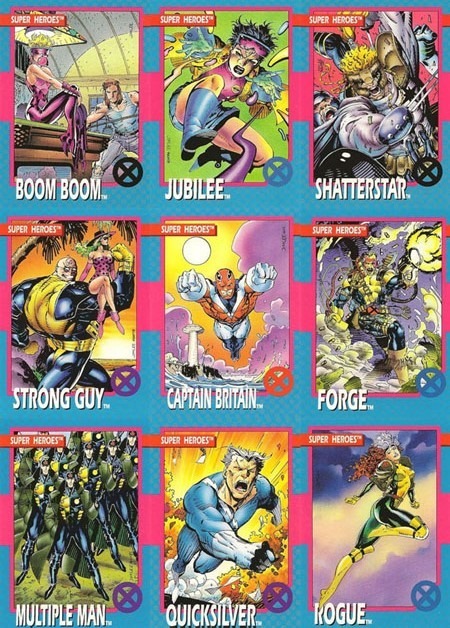 Jubilee, of course, catches my attention as having been one of the primary characters in the ’90s Fox animated series, as does Rogue! Forge I always remember from the same animated series, despite being placed in a different time for that. I think I’m actually most aware of Boom Boom from Nextwave by Warren Ellis. Here she has the "typical" look, and I think I might slightly recognize her by the bubblegum-bubble, but overall would likely not have recognized her without the name prominent on the card! And right here on the card-back is more information than I could have told you myself off the top of my head. I’d’ve thought she was a character introduced at the end of New Mutants if not X-Force #1. 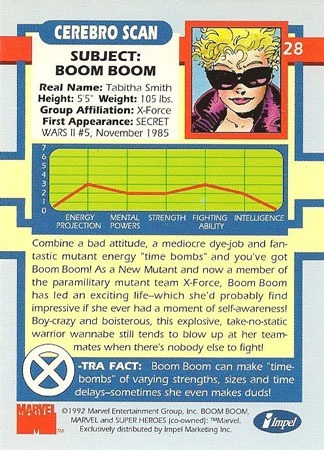 And I knew she could blow stuff up, but would not have recalled the "time bomb" aspect. 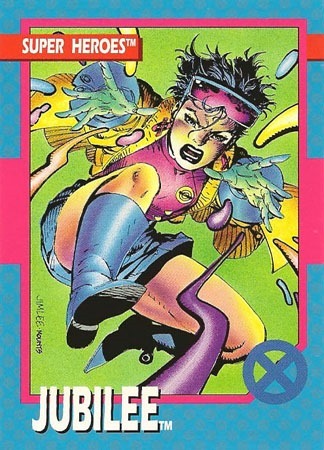 Jubilee was a "point of view" character in the ’90s X-Men cartoon series…she was the inexperienced one, the one who could ask the same questions the viewers would have, and have stuff explained without talking down to said viewers. My first introduction to her was the cartoon, and it wasn’t until later that I first "met" her in the comics. I was aware of her earliest-on in the comics in an issue of Wolverine as well as the Uncanny X-Men issue that saw a "death" of Illyana Rasputin (Colossus’ sister) at the time. 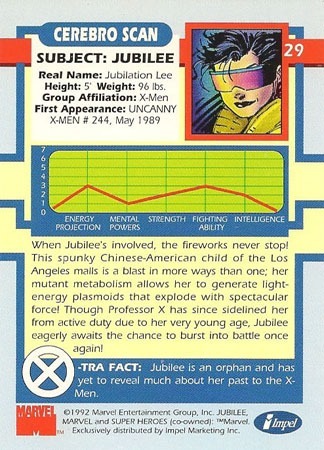 Jubilee is another character that was still very new when I came in, despite now being close to 30 years old! Nothing much new for me information-wise on this card outside of the term "plasmoids"…perhaps a way of making something sound scientific regarding her powers? 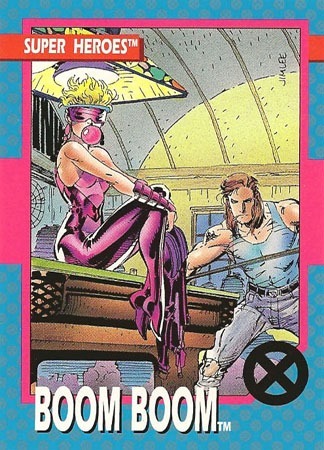 I always forget if her first appearance was #242 or #244 of Uncanny X-Men, so there’s a handy reference to have. 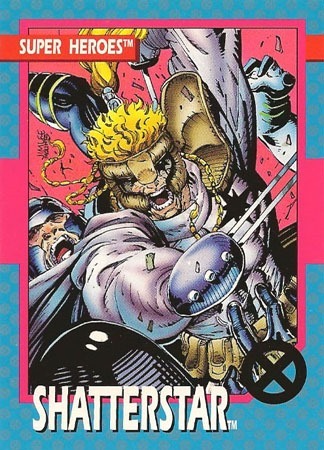 Shatterstar is a character who epitomizes "the ’90s" for me, as a character, and as a part of X-Force, and the actual X-Force title as it stood in the early-’90s. I mainly only knew the character for awhile from the Spider-Man/X-Force crossover that was collected in a tiny 3-issue volume back in the day. 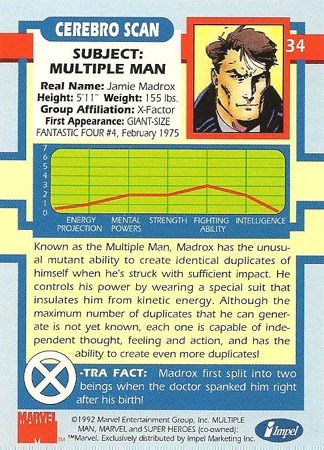 Reading the back of this card gives me more information than I ever could have given specifically about the character off the top of my head. It’s interesting that there are so many time/dimensional refugees that multiple characters up and down the timestream of an alternate reality found their way into the "main" one. Part of the convoluted nature of ’90s X-stuff, I guess. Also interesting to consider how relatively cliché it is that a character travels back in time to get help and simply joins the group they went back to interact with…or even some other group! Readily-assimilating (-ish) into a time not their own seems relatively common (Shatterstar, Bishop, Cable, Rachel Summers, etc to name just several!). 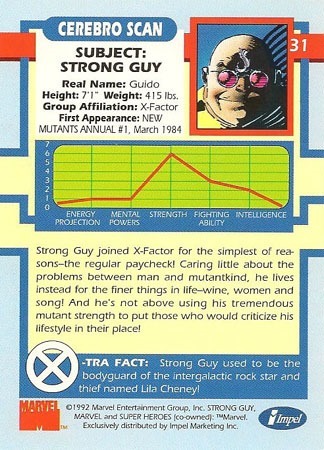 Strong Guy I’m most familiar with from the then-current iteration of X-Factor, around the 30th anniversary of the X-Men and the whole Fatal Attractions crossover; though he became more of a standout to me due to the cliffhanger leading into the original Age of Apocalypse saga. 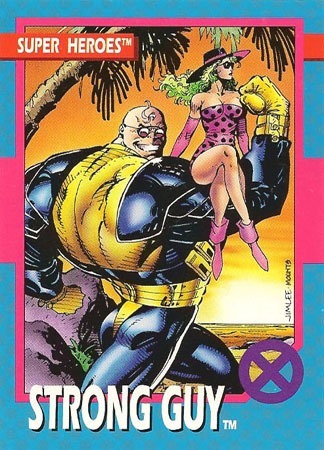 There’s not a lot of depth to my knowledge of Strong Guy, and this card doesn’t really change that. It’s handy to see the first appearance…that’s a factoid I did not know off the top of my head. I did know he used to be a bodyguard. 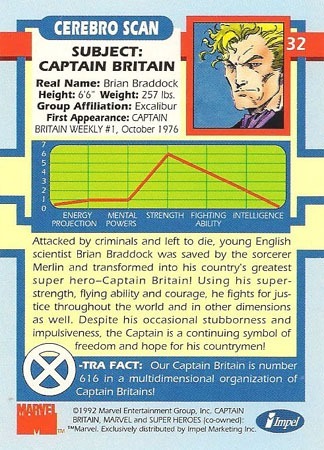 Captain Britain is a character I feel like I’ve been "familiar with" in terms of the character existing much more than I am with the character himself. He’s got a distinct look, and I’ve long associated the character with Excalibur–at least early issues that I’d been aware of. I’ve known about (but forgotten til reminded here) that stuff with Captain Britain is where we got the "616" designation of the "main" Marvel Universe. 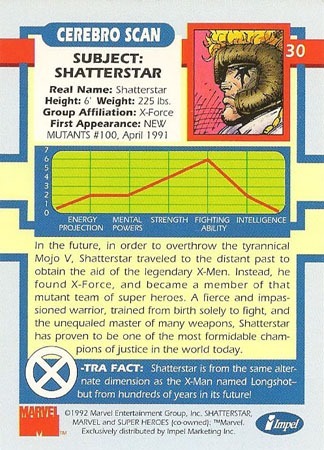 I can’t say this card really tells me much, but it’s such a little block of text for a fairly complex character, even back in 1992! 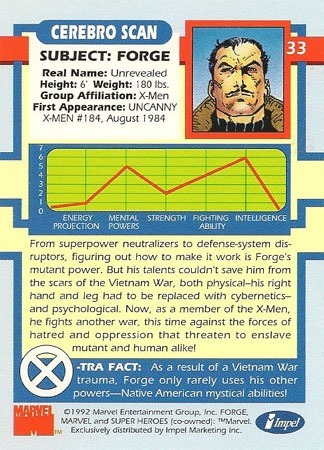 I first "met" Forge in the X-Men animated series; though in that he was a character whose present seemed to be "The Future." 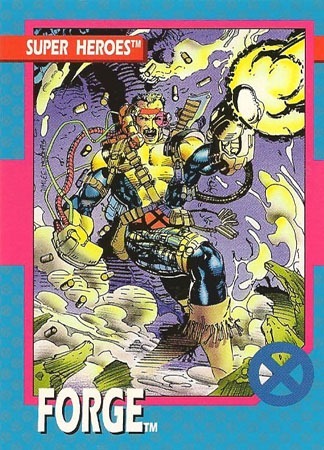 Not long after that I learned a bit more about him, at least in his existing in the present-day in the comics, and there having been something between him and Storm. …and there we go: another character I’ve learned more about from a card than I might’ve been able to easily convey myself off the top of my head. I did not remember (if I even knew) of the character’s involvement with the Vietnam war (something that dates the character a bit). 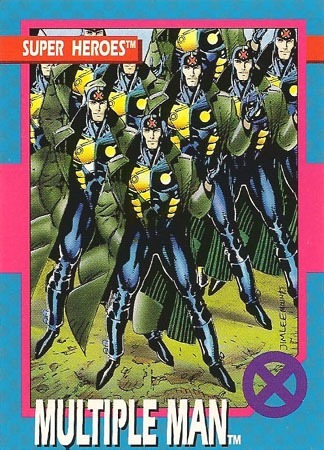 I don’t remember for certain when I first became aware of Multiple Man (Jamie Madrox), though it was probably somewhere around X-Factor‘s 100th issue when the character had "died" at the time. I think I’d gotten the issue as part of one of those department-store 3-packs or "boxed set" of a couple issues leading into/including the 100th issue. 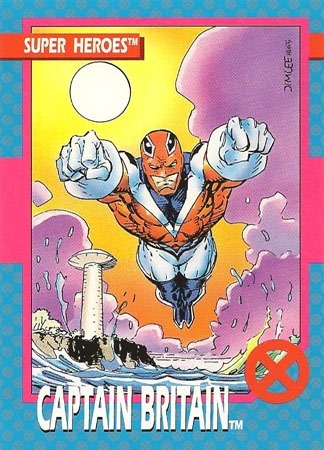 The main thing I learn from this card in 2018 is the first appearance of the character…I would have assumed he first appeared in an X-book. But Giant-Size Fantastic Four? Ok. 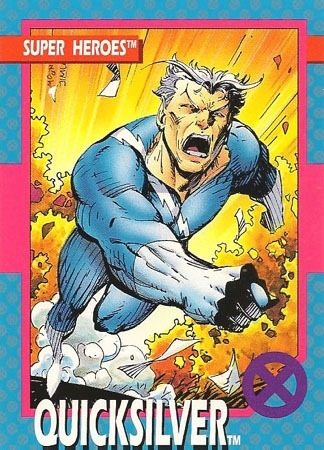 This mutant power is one of my go-to "super-powers" in answer to the question "If you could have one character’s power, which would you want?" (and excluding the likes of Superman with multiple powers). 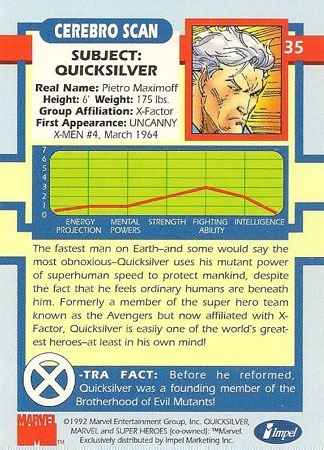 I can’t remember when I first became aware of Quicksilver…it was probably around 1993’s X-Men #25 (part of the Fatal Attractions crossover). I recall a bit of ‘hype’ around "that" issue of X-Factor where Peter David left a huge mark on the character: giving a great analogy from the character’s point of view as to why he’s always seeming like a jerk. (Something about standing in line behind someone that doesn’t know what they’re doing, and to imagine being surrounded by people who don’t know what they’re doing, every moment of every day). Ah…Rogue. 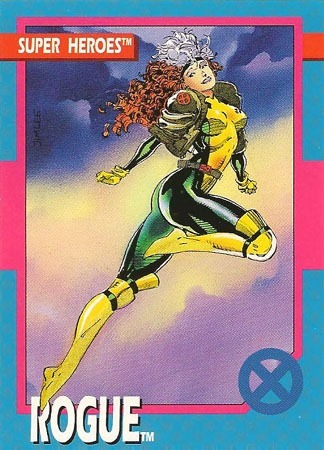 One of my favorite X-characters, largely thanks to her depiction in the X-Men animated series. It’s safe to say that as fictional characters go, she was a definite "crush" as a kid. This is my favorite design of the character (matching the cartoon series); and though I don’t mind some of her other costumes, this one’s the one I most think of for her. 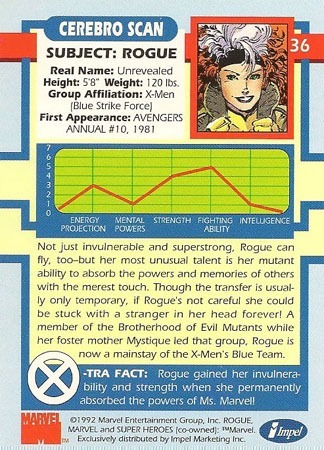 I learned of Rogue’s backstory from the animated series, as well as elements from the mini-series in the earlier ’90s. I’m pretty sure I "discovered" Ms. Marvel from the animated series before any appearances in the comics. It’s interesting to see that a major part of Rogue’s character is basically non-existent in the present; same for the impact on Ms. Marvel (now Captain Marvel). While one of my "grail" comics is Uncanny X-Men #266 (the only issue I’m missing from having a run from #240ish to 500 or so), I’d also be quite interested in getting Avengers Annual #10 for Rogue’s first appearance. 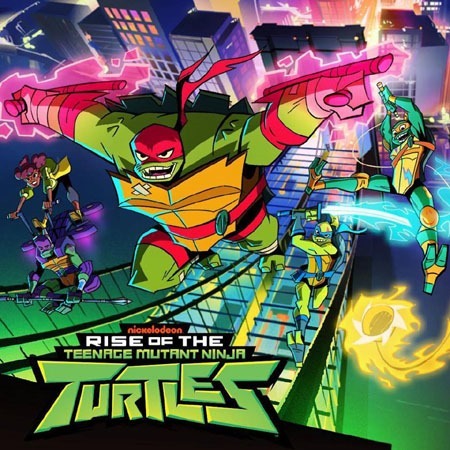 The other day, we "finally" got our first look at the character design for the new Rise of the Teenage Mutant Ninja Turtles (Rise of the TMNT) show coming this fall from Nickelodeon. To me, the best aspect is the logo. Seeing the "full/action" image and the individual images all over the place for a few days, I’ve grown used to these particular ones. But I stand by my original feeling of these being atrocious designs. I’ve long held TMNT to be an "exception" to most of my usual personal "rules" (variants, what I’ll spend on them, accepting more "crap" regarding TMNT than I will most things, giving them a "pass" on stuff I won’t other properties, etc). At the same time, I hold the assumed "right" to be that much more critical–as a fan in my late-30s who has to some degree "been there" through most of the TMNT history–nearly 30 of their almost 34-year existence. And whether it was certain of the "Specials" from the Archie comics, or the general Archie series compared to the ’80s cartoon compared to the original Mirage comics…then the Image series, the Mirage volume 4 series and Tales of the TMNT vol. 2, to the IDW series; the 2003 cartoon and the 2012 cartoon… I’m used to all sorts of differing visual interpretations of the characters. Some good, some bad, some wonky, some weird, some just…blah. But as the "mainstream, main on-going publically-pushed" (’80s cartoon, 2003 cartoon, 2012 cartoon; all the films…even Next Mutation) designs go, I find these the worst. Various designs in the comics tend to work short-term; even if I’m not thrilled with a style, often it hasn’t lasted all that long or been more than basically coming across "an alternative design." I’ve never had an actual distaste for a visual style like this. I’m not thrilled with the 2014/2016 film designs, but as live-action only-2-films takes, I’m ok with those…especially by comparison. 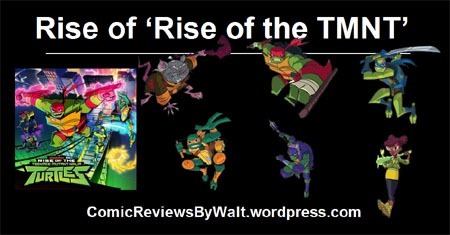 I also highly resent what my current understanding is–that "essentially," the 2012 series was ended to clear the path for Rise of the TMNT; that especially with the 2012 series only just having ended and this one having been announced prior to the end of the 2012 series, it is intended to REPLACE the 2012 series. Previously, there were significant gaps of time between series. As such, I especially compare these to that, and may be more critical due to the feeling of this being the "replacement" rather than the "next iteration" of the property. 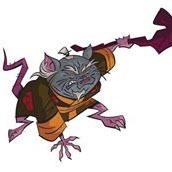 Splinter: he just looks like an angry little ugly rat to me; almost a caricature. While he has the ‘signature’ kimono and walking stick, and in context is recognizable, I get none of the fatherly/mentorly vibe from this design. He looks mean and more of a show-up-and-mess-someone-up character than father-figure/leader. Leonardo: partly the angle, but the character looks like some scrawny little thing, more like he’d be an "annoyance" than formidable. I also really dislike the sharp, angular design, especially for the legs/knees. While I don’t want my turtles to be balls, I also don’t want my turtles to be scissors with masks. I’m also not thrilled with the facial markings, though I can’t tell if that’s supposed to be facepaint or species markings. The latter I can live with, the former just seems stupid to me. Raphael: The character is far bulkier than the other turtles, which sets him apart, sure; and while I’m not thrilled at the full head-covering vs. mask-strip around the eyes I don’t have any great problem with it, either. My main problem is the apparent change in weapon, from the sai to the nightstick. Especially as Mikey has "small sticks with strings" and Donnie has the "long stick." For whatever reason, offhand, it just reeks (to me) of something thinking simply "wouldn’t it look cool if…" and running with it. 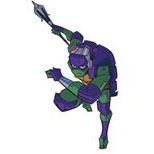 Donatello: This may be the "best" of the designs to me. 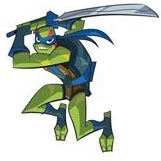 The character doesn’t seem nearly as scrawny/angular as Leo, and while I get a bit of a 2014 movies vibe with the headgear, something to the face even just looks like a Donatello: Teenage Mutant Ninja Turtle. It looks like he’s carrying some sort of scepter, which won’t thrill me; but it it’s more of a fancy stick, I guess I’m mostly ok on it. 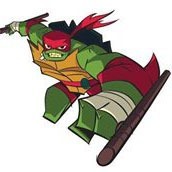 Michelangelo: I don’t care for the prominent kneepads in the promo image, nor that he basically seems to have some kind of bladed ball attached to a stick…another "replacement" weapon; a factor I’m not keen on. 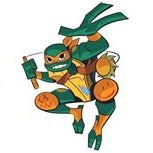 The kneepads seem odd to me in a way I can’t quite place…like they’re more for skateboarding or such than the kneepads/wraps of previous versions of the turtles. April: I’m not sure what to think here; I have a number of feelings on the matter. I sense some slight ties to some interpretations of the original comics; as all of this Rise design is so different anyway, no huge issue with the "race-bending." 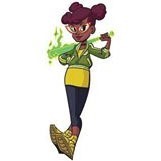 Moreso I feel like the pose for the promo image draws significantly from DC‘s Superhero Girls, as virtually every time I see her solo image, I’m put in mind of the Bumblebee character from that show/series, at a glance. I feel like she looks way too young; it’s one thing for April to be a high schooler or such, but not looking this young just seems rather "off." As I’ve seen others comment–these may look better "in motion" and such; in action rather than these singular "still" images. And I will be interested to see how these translate to toys, the inevitable action figures. I’m probably more interested in the action figures than the show. And of course, I’ll almost certainly check out the show itself at least to try…but it’s going to have to be pretty darned good right away from the first episode or two to "keep" me–it’s not gonna get much of a "grace period" from me to spend MONTHS to get several episodes to get a glimmer of what it "can actually be." Whatever the case, I still have the original cartoon on DVD, 2003 on flashdrive (c’mon, Nickelodeon…release the 2003 series on DVD!!! ), and the 2012 series on DVD, as well as all my comics and such already. I crab about Marvel comics all costing $3.99+ and virtually always put back even curiosities once I “confirm” that they’re $3.99+ for the issue held in-hand. I’m down on much of what Marvel has published for the last few years at least, and have had extremely mixed feelings on what stuff I have picked up. And I barely thought anything of it. The issue FEELS thick, and heavy, and quite possibly THE single best value in a single issue that I have come across from Marvel in a long, long time. It took me three sittings to get through this issue. Granted, I had other stuff going on, but I also hadn’t mentally “budgeted” a long time to stay put and read, used to even the extra-sized issues being pretty quick reads. I’m not actually sure what I expected from this issue. I think initially I thought it was going to be a book that was text-only; when I realized it was actually a comic after all, I decided to give it a shot. What I got out of it is that whatever the length of the finished product, it’s like this detailed “history” of the X-Men, in comic format–using new art and narrative but covering existing material. The page design includes coloring to make these glossy, higher-quality-paper pages look like old newsprint; the coloring to the story/art itself lends to that effect, giving this the appearance of a classic 1960s comic book or such. While there’s a little bit of “panel creativity” and “white space,” by and large the page layouts are tight and dense, modular classic panels–squares and rectangles with actual borders and gutters in a way that seems to have been largely jettisoned in “modern” comics. The dense visuals share space with dense text–plenty of caption boxes, speech balloons, and thought bubbles; the art is there, the art shows plenty, but there are no full or double-page splashes. The art serves the narrative, rather than some limited text serving up an excuse for big, flashy art. Story-wise, I didn’t really feel like there was anything “new” or “fancy” or such here. Nothing particularly stood out, nothing was singularly memorable. But then, I was not expecting such. 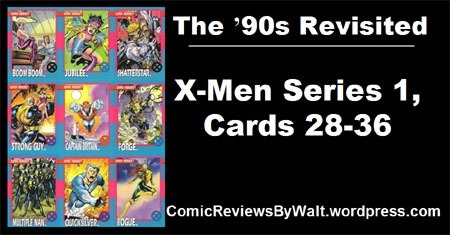 What the story is, what the writing is, is basically a straight-forward narrative, in chronological order, from the beginning of Marvel Comics into the 1960s and the beginning of the original X-Men issues. Things that were revealed in flashbacks a few issues in or 30-something YEARS’ worth of issues in, it’s here in order, unfolding as events unfolded–NOT in the order that details were doled out to readers as the actual issues were published. And this is presented as a tale from Uatu, the Watcher…giving a good context to things now being told in order. In many ways, I’m sure a lot of people would consider this a boring read, and a re-tread, and probably a few other negative connotations to stuff. Me? I thoroughly enjoyed this. Part review, part history lesson, part summary, and part condensed revisitation of classic stories. I totally appreciate comics in general and the nature of them; the occasional “new reveal” or such, new flashbacks revealing previously-unknown information, the introduction of a character from someone’s past who just happened to not have been mentioned or relevant til “now” in the story that sheds new and different light on past events. But there’s something cool and refreshing about just following a single, one-directioned narrative pulling in everything–from information we got in X-Men #1, to stuff brought up/shown into 2009, 45-some years after X-Men #1. Pages seem to have 5-9 panels each, some more…making for plenty of room to cram a LOT of story into small space. No half, full, or double-page splashes to “cheat” or anything! For my $5.99, three “sittings” to read, and sheer amount of time spent to read this whole thing, this is the best value in time-to-money I’ve found in years. As I got to the end of the issue, I wondered if this was monthly, or if I’d have to wait up to TWO months for the next issue…but then saw the next issue is supposedly in a mere two weeks. At $5.99 an issue, and biweekly, and I’m very much looking forward to the next issue? Anyone reading much of my writing of late ought to realize that alone should speak to the quality I see in this. Again–this will not be for everyone. That said…I highly recommend it, especially to anyone who is or was a fan of the X-Men, particularly the 1960s “early days” OF the X-Men. It was a late August day back in 2010, Dad left a voicemail on my cell. A bit cryptic–simply telling me to call him. As my aunt was in the hospital for something, I immediately feared the worst, and called in a panic…only to find out it wasn’t anything urgent. 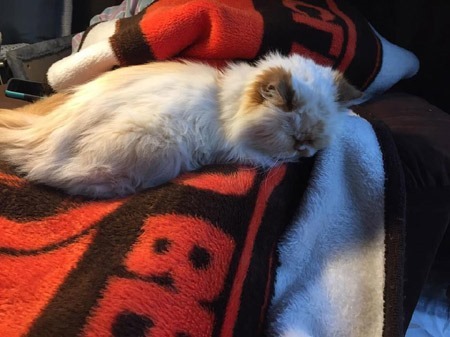 Dad had been online and came across a Craigslist listing for a cat at a nearby shelter, and Mom had insisted that he needed my blessing before there’d be any consideration of getting this cat, as I was in visiting often, and it’d only been a few months since we’d lost Kayla after having her over 18 years. I found the listing Dad had seen, and immediately approved. The shelter had him tagged as "Sigmund." I’d planned to add "Dewey" to that, both for the library-cat and figuring it would sound quite distinguished. Sigmund Dewey. The shelter had posted the listing too early, so Dad had to wait a few days–they had to allow time for notification any potential owners to come in and reclaim him. During that time, I recall posting in a blog at cxPulp that whether he knew it or not, this was a lucky little cat–because though he was in a shelter for the then-moment, he either had a family that would reclaim him…or he already had a family that wanted him. And as things went, on September 7th, 2010, Dad went in. As he’s told me, he walked into the place, and even with the other cats meowing and reaching out and clamoring for attention–Dad only had eyes for Sigmund. 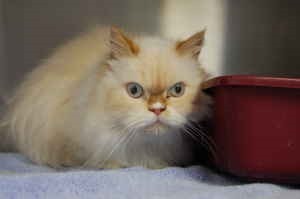 …Sigmund, who huddled in the back of the cage and wanted nothing to do with anyone, let alone being pulled out of the cage. But Dad got him out, and that day, he brought this cat into my life. My conscious plan was to "tolerate" this cat, to "put up with" its presence…I wouldn’t be mean or anything, but I’d be indifferent–he was gonna be Dad’s cat. That evening after work, I drove the hour in to meet this cat. Such a significant thing, adopting anyone new into your life–and I had to see this cat for myself. One look at him and I got down on the floor to get his attention. He wasn’t sure of me at first, but then came over to check me out, and allowed me to touch him. (And for the rest of his life, "our thing" was that I was the one that would get down on the floor with him, so he almost never would hop up onto me). While we were talking, the matter of his name came up, and Mom had a slip of the tongue, clearly saying Ziggy where Dad was calling him Siggy (for Sigmund). The cat looked RIGHT at her, and we realized in that moment that THAT was his name. And he got several "pet names" or nicknames. In my own recollection, I most think of "Little Buddy" from Dad, as he’d call Ziggy or get his attention. (And that he was, he was Dad’s little buddy!). To me, he was "Handsome Cat" (cuz I thought Handsome more fitting than Pretty or Beautiful, though those absolutely fit as well). 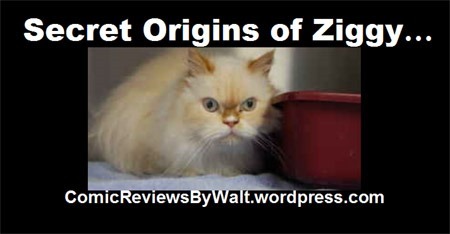 And to everyone, he was also just Zig, or Zig-Zig, or such. But Ziggy was what his "full name" has always been, at least to me. Just like I’m Walter, but go by Walt. He was Ziggy, though he’d go by others as well. The first photo above is the photo from the original listing, the very first photo I ever saw of him, the very first, period, that I ever saw OF him. And just above, him resting on Mom, is the final photo I have of him. The very earliest photo I have of him. And the very last. Dad brought him into my life on September 7, 2010. And I had to say goodbye to this sweetest, gentlest cat I have ever known, on December 7, 2017. And in between these photos? I have THOUSANDS more. It takes all I have right now to hold it together just handling these two photos right now. I’ve shared hundreds, maybe thousands of photos of him before–on Facebook, in messages to friends, occasionally in this very blog. It is us, those left behind–Me, Dad, Mom, our other cat Chloe, friends and family who knew him–that suffer. Hurt. Have to pick up the pieces of broken hearts. Absolutely nothing in my life before this has ever hurt so much, or affected me as this has. So very, VERY loved, and missed more terribly than words alone can ever begin to describe. It’s been a long time, offhand, since I read a comic quite so dense as Doomsday Clock #1. And I use the word dense as a good thing overall–in this age of $4.99 comics that hardly take any longer to read than a $3.99 or $2.99 comic, where everything is written to flow seamlessly as a 4 or 5 or 6-issue "graphic novel," it’s great to have a comic that just wants to be a single issue. I was rather frustrated to learn that the image I’ve seen MOST USED in association with this issue (the Gary Frank Superman cover pictured above) is actually a VARIANT and not the "main" cover. The main cover seems to be a generic "The End is Here" cover (that leads into the issue itself as the classic Watchmen covers did!). In keeping with my usual, though, wanting the cover I’ve most seen advertised and such with an issue, I managed to get the Superman cover. Of course, then I saw a lenticular variant, one I had probably heard of/read about, but not paid attention to (again: VARIANT)…but it being lenticular, and "cover price" (albeit $1 more than the standard issue to account for the lenticular-ness) and me really getting a kick outta the design–Rorschach’s face goes from just the blobs to the symbols of "the trinity" (Superman/Batman/Woder Woman), I went ahead and got that one as well. It’s certainly no worse than having bought a Marvel lenticular, where the lenticulars were entirely different images from their "regular" covers. I don’t know what I expected from this issue. 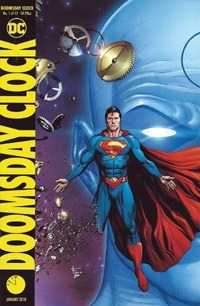 Being that it’s an obvious follow-up to Watchmen, and apparently integrating those characters into DCU canon (if not continuity, then perhaps affecting continuity from the outside), and seems to have been "timed" to release at the 25th anniversary of Superman’s death (real-world, that is–November 17-20ish 1992), and stuff previewed or "leaked" online indicated an in-issue reference to that date…I had extremely high expectations for this issue. It’s honestly been a long time since I feel like I actually was taken in by "the hype," usually seeing the hype entirely for what it is and maybe "choosing" to "give in," say, on actually getting a variant cover, or actually getting an issue of something I don’t normally get, or diving into an event I’d intended to stay away from. Here, it’s more of an emotional hype…one that left me feeling rather let down. As said above–this is a dense story–one that would take a long time to really summarize, and for my own reading experience, get well beyond the initial reading I tend to do for reviews. Essentially, we meet a new Rorschach, who is piecing stuff together, much as the original did, starting out the original series. We get glimpses of this current world–late 1992, about seven years after the original’s 1985 setting, as we meet various characters and are re-exposed to older/originals. We also learn that Ozymandias has a sort of countdown clock of his own going this time, but in a much different way than before. Finally, the last several pages give us a glimpse into a non-Watchmen DCU, and an extremely familiar-looking take on the Kents…which makes sense, given Frank was the artist on Superman: Secret Origin, that laid out a particular vision for the characters. While this has a lot as a single issue, and certainly many layers with stuff that’d be picked up after a second or third or FIFTH reading, still more to be picked up on STUDYING the art beyond the words, and even more on top of that to be noticed after subsequent issues come out and shed more light on stuff…on my single-read-through I hit the end and thought "Wait…that’s IT?" and was starkly reminded of similar disappointment with Grant Morrison‘s Final Crisis. This is not a "casual" issue, apparently. Picking it up and reading it "cold," even if you’ve read Watchmen, there doesn’t seem to be all that much to it. It’s a first issue, and world-building or re-world-building. It’s surely a strong foundation on which the rest of the issues will draw. But for me, in just picking it up, after all the months of hype, I just did not enjoy it or get much out of it. And I’m steeped in comics history, especially DC, and even more specifically Superman. Visually, it’s a very good issue–I’m quite a fan of Gary Frank. I felt like there was a lot that was recognizable and familiar here, despite Frank not being Gibbons, and outside of not seeing a Superman costume or a Batman costume or a Wonder Woman costume–really, it felt like there was virtually nothing actually DC in this issue–I felt like this was set in the world I recalled from reading the original Watchmen all those years ago. There’s also a LOT crammed into this issue: it seems to me that the lowest panel-count on any given story-page was five…which is a far cry from the all-too-often-used "cheats" of full or DOUBLE-page splashes with barely a word to go with the art. I welcome the "grid" layouts of the pages, the actual panels and "traditional" gutters–both for squeezing in more content as well as mimicking the style of the original. Basically, this seems like a really slow start to something, and that it was vastly overhyped, as well as being quite "confusing" as far as the covers go–once again, a major problem with doing variants AT ALL. The $4.99 cover price is rather steep, even with 30 pages of story (if a 20-page issue is $2.99, another 50% would be only $4.50!) but I suppose it’s a bit offset by some of DC‘s issues being $3.99 (the 1-per-month books) so this actually fits that rate. I wanted more–I wanted something brighter and splashier out the gate than what I got here–but I’m still looking forward to the next issue, looking forward to see how things build, though I suspect this will be a far more impressive story in larger chunks or as a whole rather than as a single-issue-at-a-time monthly (or less-frequent) journey. This is it–probably the most important single issue of any comic book in my life…at least to me, personally. This issue has–in one form or another–influenced so much of my experience in/with/of comics, far beyond anything I could truly sum up briefly. 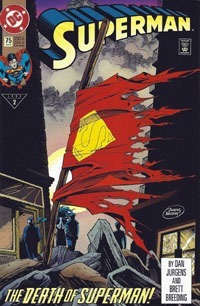 The cover is that iconic image–the tattered cape caught on a wood pole sticking out of the wreckage in Metropolis–that has become so symbolic of the fall of a character, and so defining of this story and the Superman character. At least to those of us who read this as a new comic, were there as the story unfolded. The issue is itself nothing but splash pages, each page a single large image, ending with a fold-out back cover stretching to a triple-wide image. Nearly every single page is "iconic," each page being a key image, something easily recognizable as being from this very issue. So much so that these images were used time and again for flashbacks, and capture the key "moments" of the end of the battle…and are reinterpreted to this day to place a flashback within this story. This issue’s art–for the full pages, the sheer importance of the issue in the time, and what it was to me–is certainly the "gold standard" for Superman art, and for Jurgens‘ work on the character. Story-wise, this is but a handful of moments, of scenes, each page having to carry stuff forward…but it certainly works. For several chapters now, the panel-count has gotten smaller, the action more intense, the story speeding up, rushing to this conclusion. 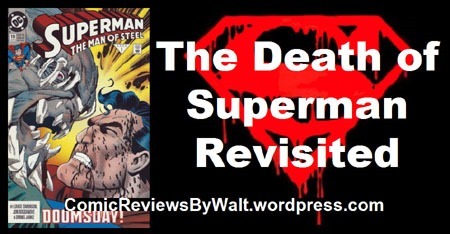 And what a conclusion it is–Superman dies. I felt on this read-through like the "final punch" is earlier in the issue than I remembered and expected…but perhaps it was the way I was reading. While we get some moments of Doomsday menacing Lois and Jimmy and Cat, for me, the heart of this issue–morbid as it may be–comes in the narration after the final punch. This is some of the most "iconic" narration for me in all my years of reading comics, and resonates with me still. Like weary boxes who have gone the distance, the combatants collide in one last, explosive effort. In the years to come, a few witnesses will tell of the power of these final punches, that they could literally feel the shockwaves. Others will remember the enormous crater that resulted from the sheer force of the blows. But most will remember this sad day as the day the proudest, most noble man they ever knew–finally fell. For those who loved him–one who would call him husband–one who would be his pal–or those who would call him son–this is the darkest day they could ever imagine . . . And for those who served with Superman in the protection of all life–comes the shock of failure. The weight of being too late to help . . . For a city to live, a man had given his all and more . . . For this is the day that a Superman died. The views moving around, showing us Lois and Jimmy, Martha and Jonathan Kent, Ice and Bloodwynd…we get the "in the moment" reactions as the characters all witness the final punches–in person or on tv. And then the final scene, as Lois cradles the broken Superman, and even still, his concern is the safety of others, never mind his own condition. And he hangs on just long enough to hear her assurance: "You stopped him! you saved us all! Now relax until–"
And as the final page is folded out, the image goes from her holding him, to her obvious anguish as he’s slumped over, dead. I’m absolutely anything but impartial on this issue. Even reading it this time through, it never fails to stir me. TWENTY-FIVE YEARS LATER, it still gets to me. It seems unbelievable that it’s been that long since this issue was released. I was all of 11, a couple weeks shy of my 12th birthday. I’ve lived over 2/3 of my life SINCE this issue. This was the first truly "big event" in my experience in comics…both story-wise, and real-world. This was the first issue I encountered with any sort of "variant cover." This was the first time I saw an issue done in all full-page images, the first time I’d heard of pre-ordering comics, the first experience I had with "speculation" and such. This issue began "the weekly habit" of comics for me, that "have to get it ASAP" mentality of each new, subsequent issue. That ongoing interest in the next chapter, what comes next, how are these characters handling stuff, etc. And this being in the heart of what I’d call the best of times, the highest quality and tightest story of the "Triangle Era," this became my gold standard for comics, what comics could be, and all that. To this day, when I come across this in bargain bins–in any of the four printings, UPC barcode or "direct edition"–I tend to snag it. While this–like most of the other issues of the Doomsday! story–draws deeply from preceding issues and ongoing stuff…this one works pretty well alone. 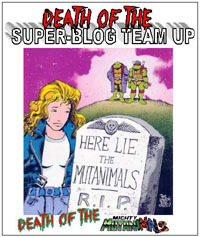 As you’d be interested in the issue AS "the death issue," of reading the actual death of Superman, it happens here. 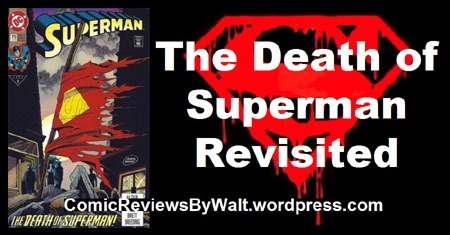 You witness the death, the final moments of the battle, get exposed to several key supporting characters, and can glean from context that others have fallen and it’s down to just Superman himself to take the creature down, the doing of which costs him his life. While this is basically at best a "footnote" in the history of Superman…this is one of those issues that I think any "long term" comics person ought to (have) read. It’s still a piece of history, a part of comics history, and very few other comics’ stories or moments have or retain the impact this did. This issue has one of the most iconic covers of my life. It may not be a favorite, exactly–it’s not one that’d really work (for me) as a poster image or such–but for a lotta years, just because of the cover date–January, 1993–and being the first Triangle # of 1993, this was an image I pictured when I’d think of "1993." 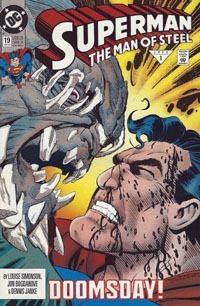 The image is "just" an extreme close-up of Doomsday and Superman literally getting in each other’s face, the creature being larger/taller and bearing down on the (black)-bloodied Superman (though no real/obvious facial wounds for the blood, but hey, it adds effect, right? And had to get by the Comics Code Authority and all that. Despite reading this entire Doomsday! story fresh, I’ve realized that part of my confusion on the gradual tearing-away of Doomsday’s suit and the reveal of the hulking grey-and-white creature is the inconsistency from book to to book of its depiction! While there was some severe tearing and a big chunk missing, where we left off in Action Comics #684, the creature very shortly later now has far more of it gone. I expect that’s the peril of having to get multiple issues drawn by differing art teams in a short time, and the thing was probably set on the notion that "most of the green suit is now gone," but no ultra-hardline visual "bible" to lead it. Of course, this is–to me–mere "observation," something I don’t recall consciously noticing quite in this way before, and I have no problem with it! This issue has us down to only two panels per page in the several-issue declining-panel-count countdown to the main issue of the story, and as such is increasingly fast-paced with less dialogue and less room for pauses…just faster visual beats on the march from cover to cover. Perhaps it’s the increased action, the ferocity of the battle, but I dug the visuals on this issue a lot more than I did the previous issue, with several iconic moments (to me) in this issue: from Doomsday’s first kills in Metropolis, Superman trying to take the creature into outer space, Doomsday’s elbow-stab of Superman, and the Underworld explosion, Doomsday one-punch taking out Supergirl, hitting her so hard she reverts to her protoplasmic state, the look on Bibbo’s face as he, Hamilton, and Mildred realize they’ve not only angered the creature, but it’s gonna land right on them if they don’t jump…and the shock-cannon blasts from the Cadmus troopers as Superman and Doomsday pound on each other, with Superman thinking "Even if it kills me–Metropolis is where I hold the line!" And in a way, that sums up the issue. 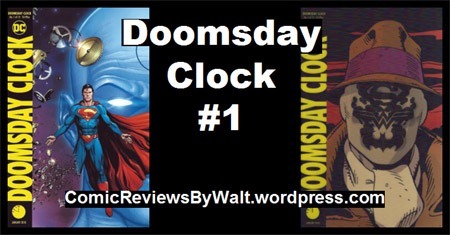 Going from scene to scene, as Doomsday hits Metropolis like a wrecking ball, killing immediately and continuously, punctuated only by attempts to damage him, whether by Superman or Professor Hamilton with a sci-fi cannon of his own, and so on. There’s not much story, exactly, but this issue’s not intended to be all that deep in that regard, and receives no penalty from me for it. It’s also a credit to the Dirk Maggs dramatization of the story that I "hear" echoes/flashes of that as I read this, as it definitely gets across the frenetic ferocity of the situation, and certainly moments out of this issue. Yet again, there’s not exactly a whole lot to be gotten from this just as some standalone single issue at this point, picking it up some twenty-five years after publication. It’s a key chapter in the overall story, and maybe sees Superman take some of the worst physical damage ever to this point…certainly more than I remember offhand seeing him take on-panel in Superman #75. While I mentioned early in this post that I don’t see this issue’s cover making a great poster, I could probably be persuaded pretty easily, as I do think on a small scale this would work as wall art at its actual-comic-cover size (perhaps amidst the other issues of the story). This is definitely well worth snagging from a quarter bin or otherwise bargain bin if you can get all the issues of the story (or all the issues you are interested in at the time), but I’d continue to recommend a collected volume of this story over the single issue for "best results" and maximum impact.